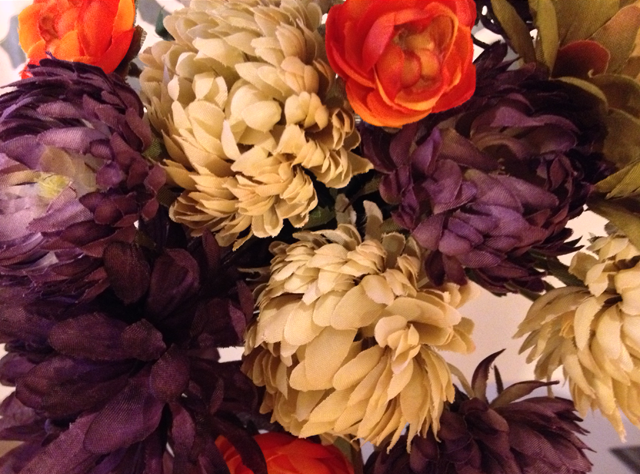 It’s officially Autumn! I celebrated by wrapping up in a grey infinity scarf (a gift from Berlin) and indulging in delicious coffee and some much-need R&R. How have you spent your first days of Fall? 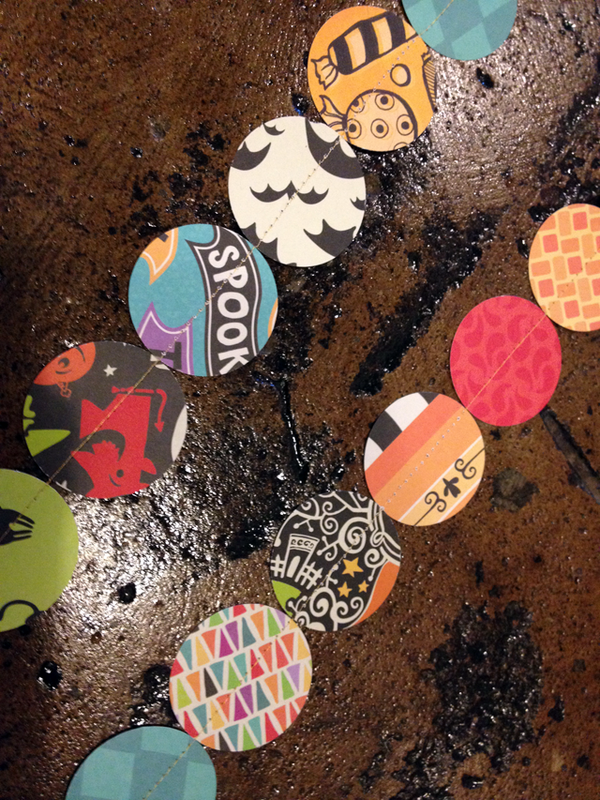 Of course, yesterday wasn’t the beginning of my favorite season without a little crafting. 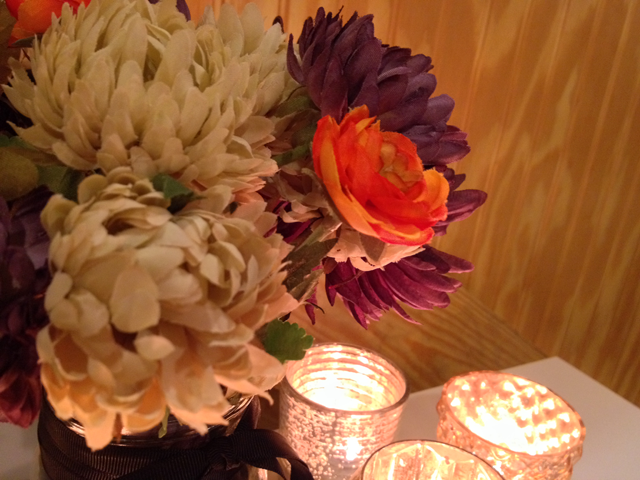 Looking to spruce up our tiny kitchen table, I fashioned a small autumnal bouquet of dusty purple and ecru mums, a green gerber daisy, and a few orange ranunculuses (ranunculi?). 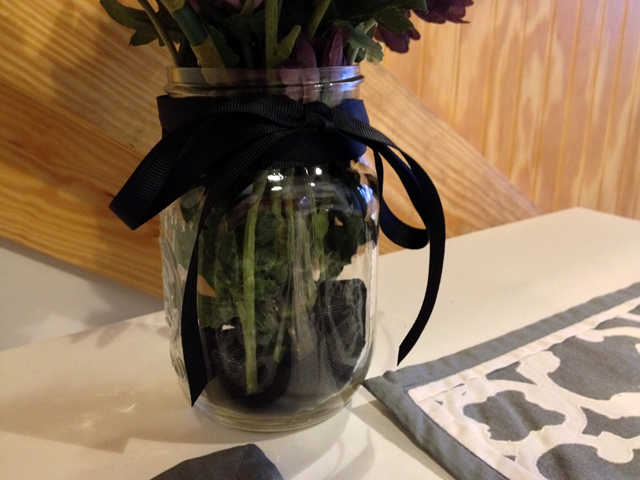 The mason jar and grosgrain ribbon give it all a homespun feel. 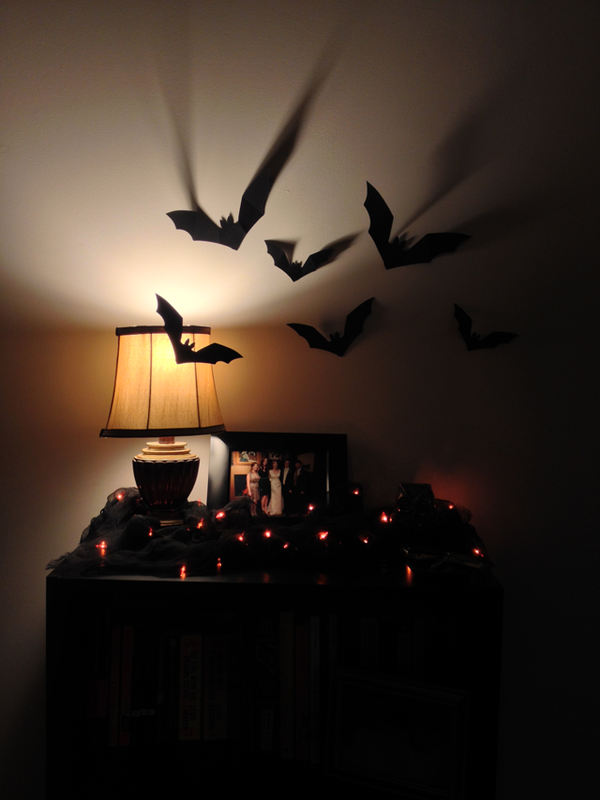 Unapologetically fake and a tad gloomy, I think this arrangement will be perfect for October – which is rapidly approaching by the way! May I take a moment to express my feelings for mercury glass? 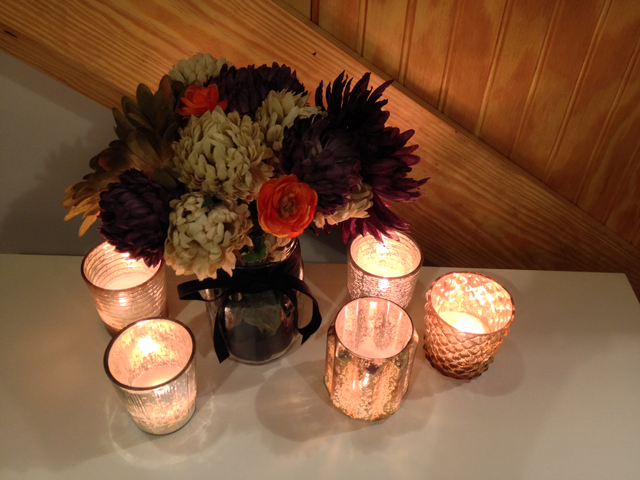 We bought 12 of these assorted votive holders for our wedding last year, and I cannot get enough of them! 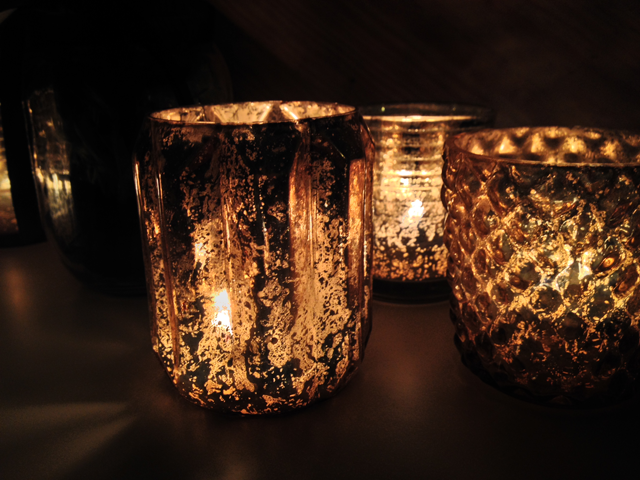 The crackled effect of the glass is beautiful enough for special occasions and spooky enough for All Hallow’s Eve. 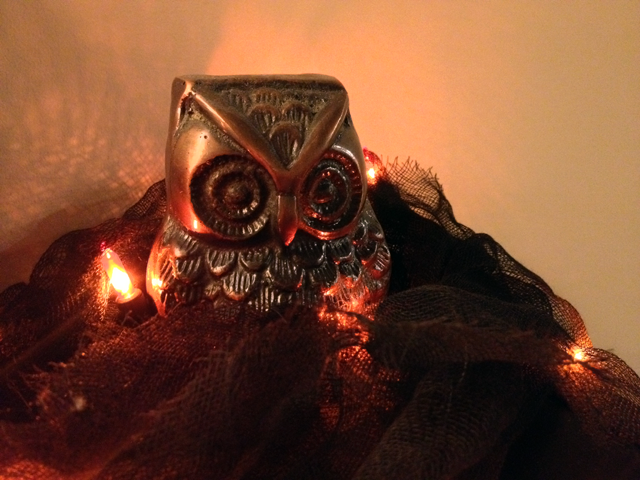 It’s not too soon to start decorating… right? Sometimes you gotta roll with the punches… make lemonade when life hands you lemons… keep calm and carry on. What I’m trying to say is that sometimes DIY goes madly awry, but that doesn’t necessarily mean it’s “game over” for your project. In fact, deviating from your original plan – or scrapping it entirely – can yield stunning results. 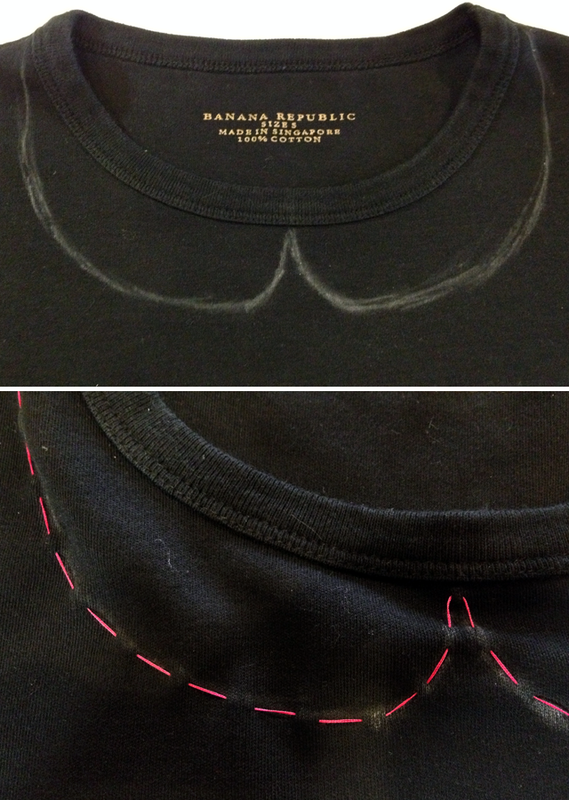 Long story short, I put a not-so-small hole in this sweater. Like, front and center… which is a problem since I had set out to embellish the front of my cardigan with heavy beads and buttons. Instead of a DIY pièce de résistance, I had an unraveling mess on my hands. Y I K E S.
At moments like these, I put my project down and walk away. Taking a break gives me time to think through my options, say a bunch of swear words, and reboot. I weighed the pros and cons of several ideas over a cup of coffee, but ultimately decided on the simplest fix: put a bow on it. A BIG ONE. 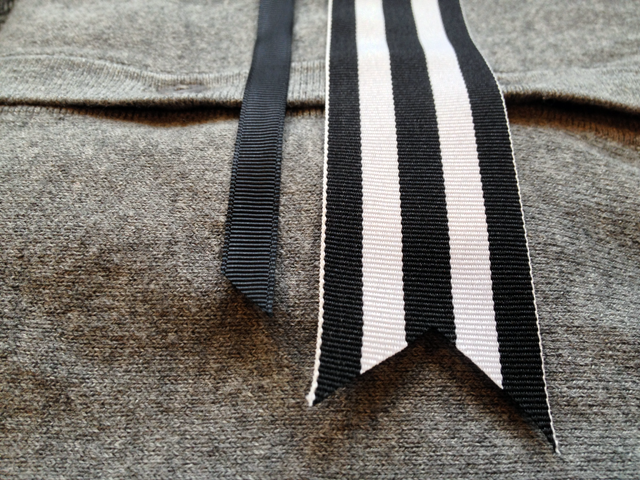 So, that’s how this bow-bedecked cardi came to be. I switched out the plain buttons for shiny (plastic) gold ones and placed a small silver-lined bead in the center for added interest. Much to my surprise, the buttons actually sparkle as they catch the light! 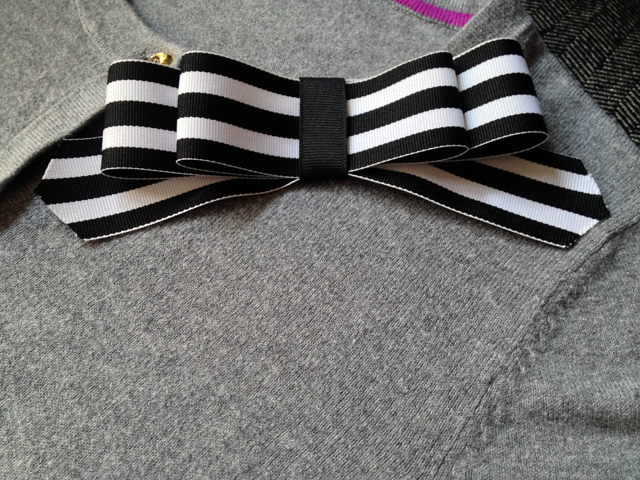 I fashioned a large bow out of black and white grosgrain ribbon and sewed it onto the collar. The bow not only hid the hole (which has been patched), but transformed a basic cardigan into something wonderfully chic. 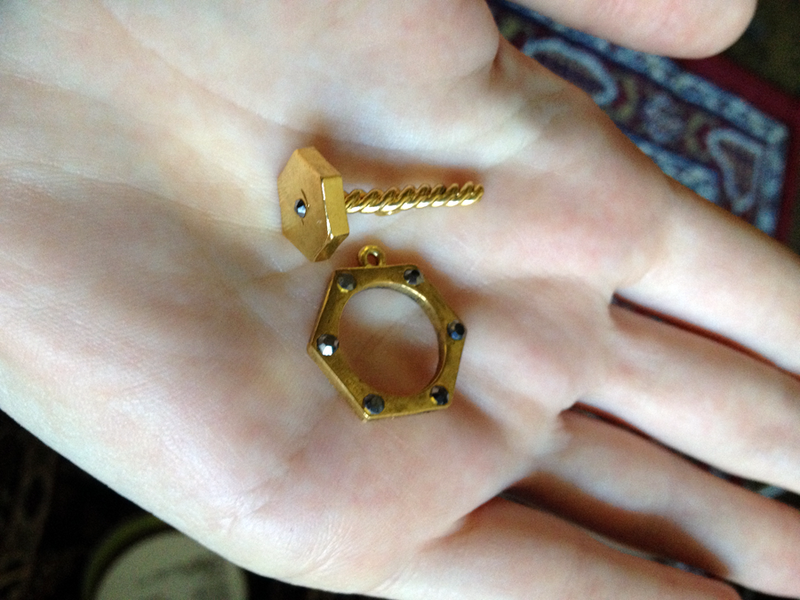 While disappointed my original project never came to be, I am thrilled with what I made in the end. This cardi will transition from work to weekend seamlessly, and because the details are timeless, it will work with any season. 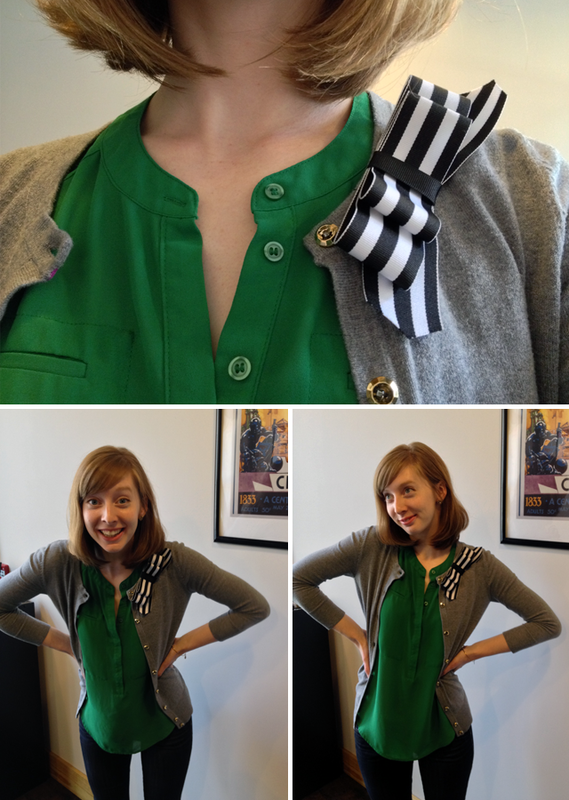 Here, I have paired my newest creation with an emerald blouse (Pantone’s color of the year!) and my favorite pair of denim. Throw on some black ballet flats and I’m ready for Sunday afternoon. My dear friend and very crafty maven Sarahrulu (of FHF fame) brought a lovely embellished cardigan to my attention this week. 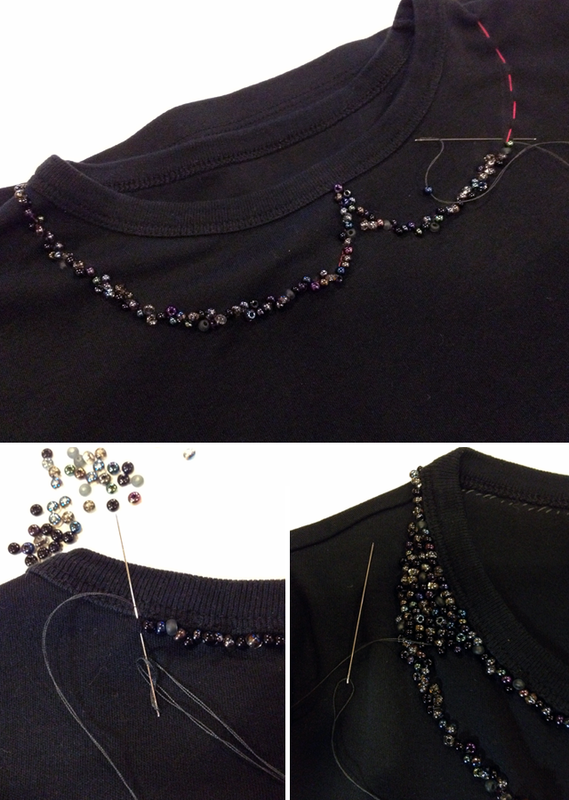 A simple crew neckline goes from “blah” to “ahh!” with pearls of all sizes and a sprinkling of rhinestones. You can see it here. 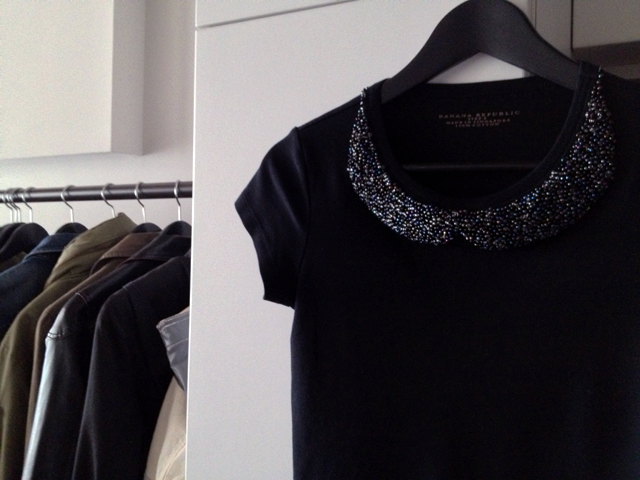 Once I stopped swooning – it took a bit – I began to day dream about my own fancy cardi. 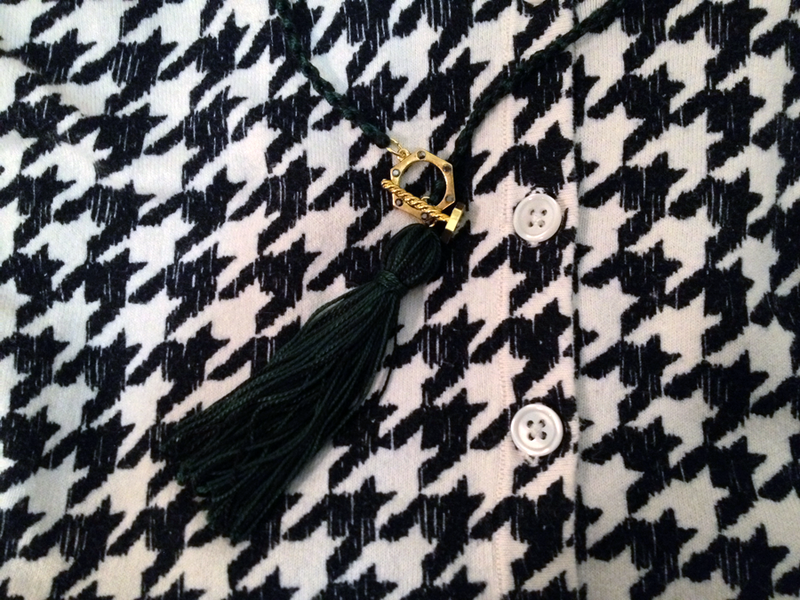 Swap out that buttery yellow for a fall-appropriate neutral and add a healthy dose of academic chic. Now we’re talking! 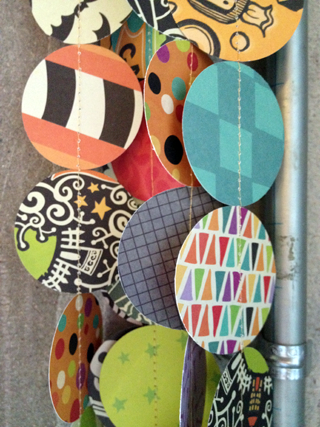 And so, as it always goes, I found myself at Joann’s last night… but not before I made a Target run. Snatched this heather grey Merona crew-neck cardigan for only $13! That’s a bingo! I’m not entirely certain what I’m doing with all these delightful craft supplies yet, but that’s never stopped me before. Oh! Do yourself a favor and listen to “Sweater Weather” by The Neighbourhood. Fall’s rich colors and luxe textures demand accessories with just as much visual impact. 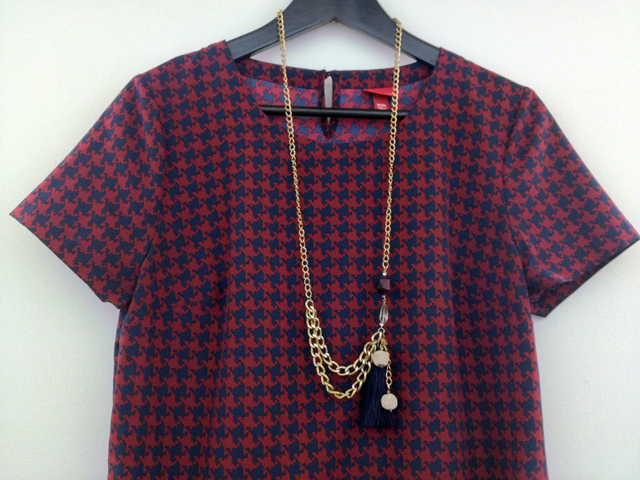 No offense to dainty jewels, but I want pieces that bring some edge to feminine cardigans and fit-and-flair dresses. That means chains and lots of ‘em. 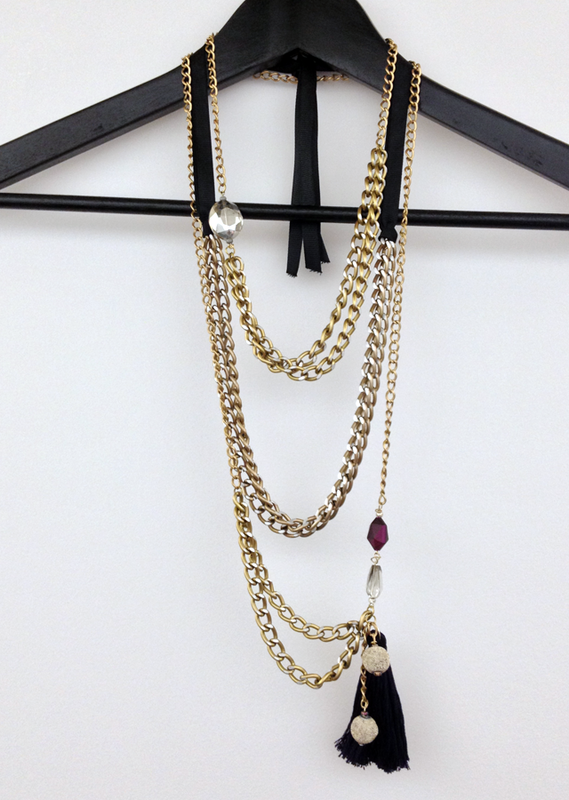 To indulge my inner goth kid – yes, she’s very real – I’ve whipped up three necklaces that can be worn all together or on their own. 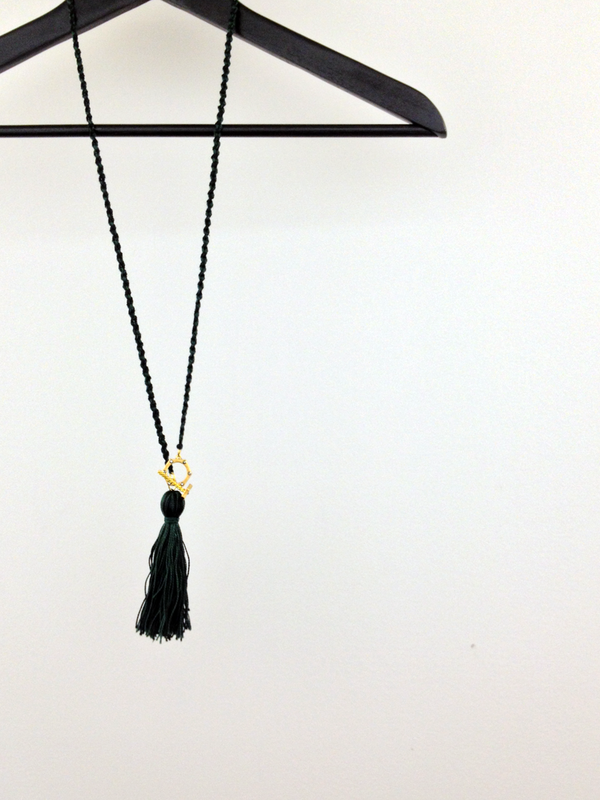 All different lengths, the three necklaces use the same antique gold chains and are complemented by translucent grey and matte burgundy beads, black grosgrain ribbon, and a deep navy embroidery floss tassel. They’re just the right mix of alt-rock and classic opulence – without the price tag. I am especially intrigued by the thicker gold chain with the silver accent. 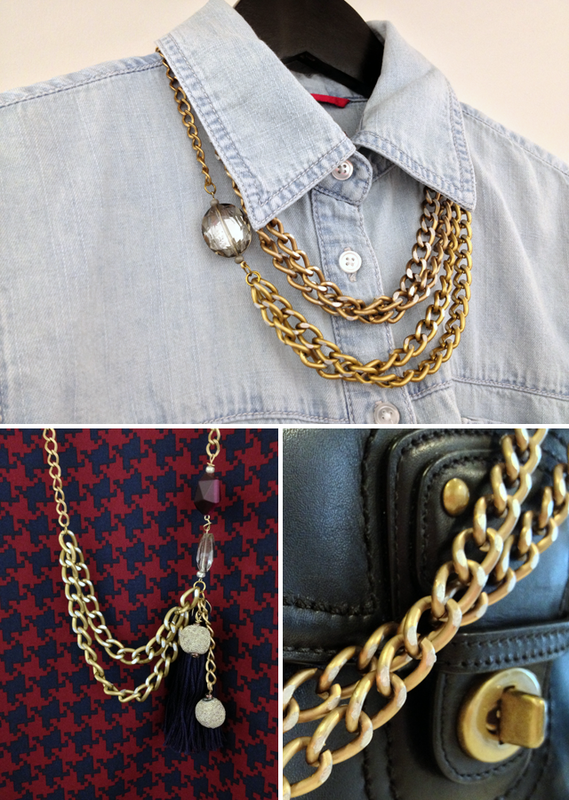 Mixing metals, even just a little bit, adds dimension and roughens up the look. 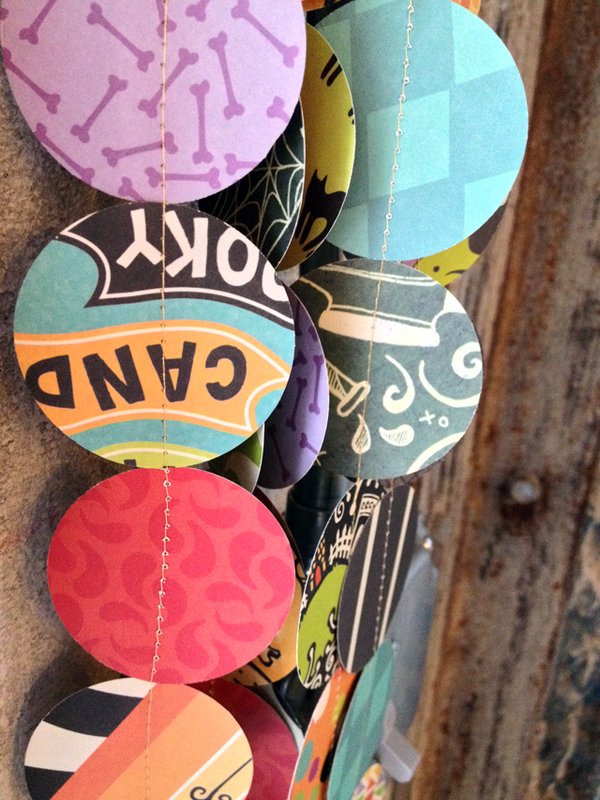 This particular one was inspired by a Madewell necklace that I blogged about a few weeks ago. 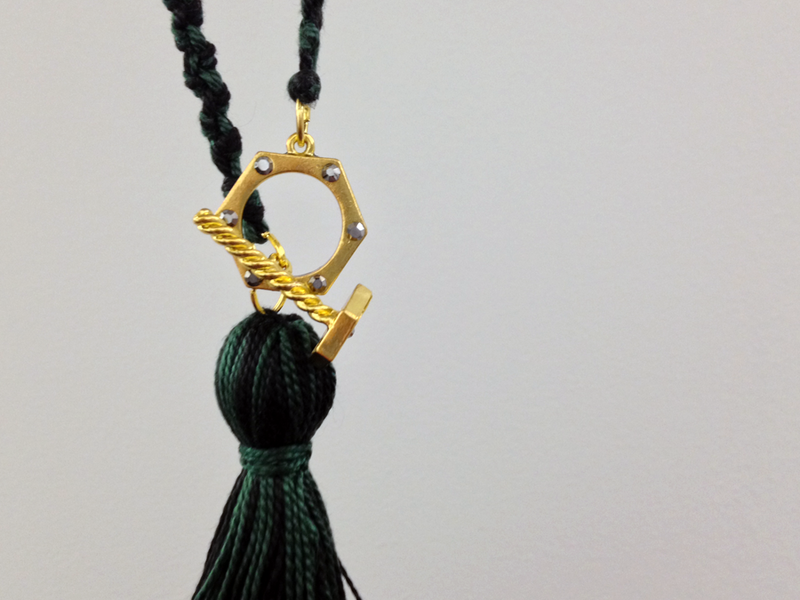 I love unusual pieces… especially if they have tassels. 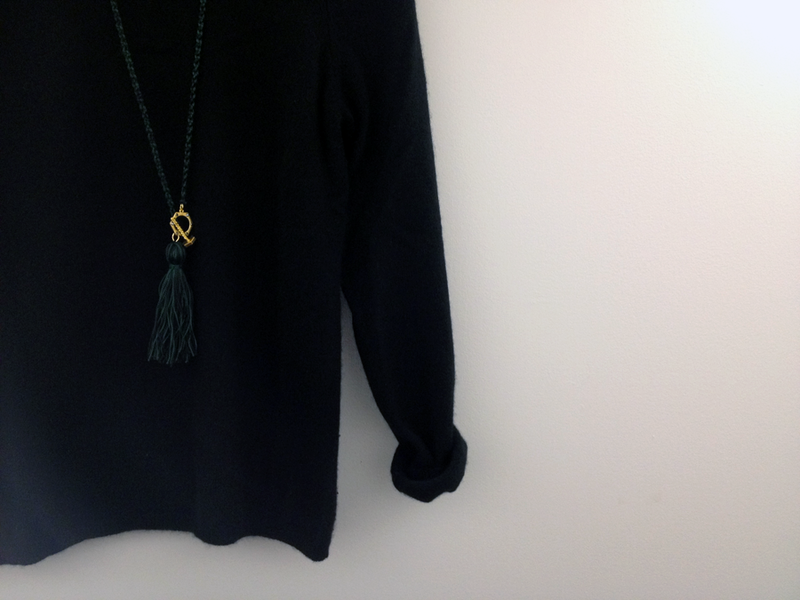 If you’ve been visiting FOLKLORE recently, you’ve probably noticed that I’m on a bit of a tassel binge.